If you want a small pocket synthesizer for less professional performances, you have several options to choose from. One of them is Kaossilator 2 by Korg, a successor to a popular first model. How is the new one standing compared to its predecessor and other products of this type on the market? Let´s see what it brings. 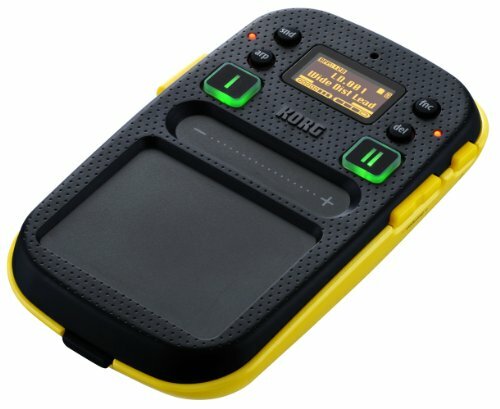 Korg is pretty well experienced manufacturer of instruments and other musical accessories, so we didn´t expect anything but a well done job with Kaossilator 2. In comparison with the first model it´s definitely smaller in matters of size, but not in matters of usability. This small sound generator is controlled via capacitive touchpad. You can adjust pitch and range in horizontal axis and things like modulation, feedback or cutoff by moving the vertical axis. And what can you adjust? Well, with Kaossilator 2 you get up to 150 sounds stored in memory of the device and what more, it offers a built in microphone and a possibility to connect external devices. All of your recordings may be saved to microSD or SDHC card. Quite a solid output from such a small device, isn´t it? In a simple box you will find the device on its own, user manual and two AA batteries which powers the unit. Remember, AA batteries are only strong enough to keep it alive for about 5 hours at all, so you should rather never forget to have replacement cells with you. There is also possibility to run it with AC adapter, but this is not part of the package so if you want it, you have to buy it separately from Korg. Now let´s take a brief look at the device. A small plastic box with 7,6 x 12,8 x 2,5 cm dimensions is definitely not bigger than any of common cell phones, so you can comfortably wear it with you once you don´t need it. Net weight without batteries is 105 g so it´s not such a big load for your pocket. The front side features almost everything important. The main part of Kaossilator 2 is a capacitive touchpad on the bottom and a touch scale above it. On the top half you may find two big buttons for selecting loops and a small display with four buttons around. They control Sound, Function, Arpeggiator and Delete functions. Upper edge of the unit comes with two separate 3,5 mm jacks for connecting your headphones or external microphone and one input for external adaptor. Left edge comes with speaker output and a button to mute/unmute microphone, while right edge (after unmounting the cover) offers slot for microSD/SDHC cards with capacity up to 16 GB. And how does it play? Well, Korg promises that the basic 150 built-in sounds should cover all genres of music and we must say that the promise is not odd. Kaossilator 2 divides sounds to several types like leads, basses, acoustic sounds or special DJ effects. Internal Gate Arpeggiator allows you to tune the phrases exactly how you want them to be. There are 50 patterns for arpeggiator which is enough to make you happy. How would the music be without drums? Well, it would sound really strange, so you have 15 special Drum Kits in this unit with possibility to create unique patterns via the touchpad. The least, but definitely not last advantage of Korg Kaossilator 2 is possibility to connect it with iKaossilator app for your Apple device (iPhone, iPad). This gives you opportunity to sync both of the devices and create even better overall performance. And how does the final conclusion sound? Kaossilator 2 is a solid pocket synthesizer which can be very useful anytime you can´t have classical big professional equipment. It has quite wide range of options. Power consumption is pretty high and batteries won´t last too long. This is a little downside, but it could be solved simply with external AC adapter.